Scare first issue UK quad for 60s thriller Ice Station Zebra. Featuring fantastic artwork by McCall. Little tears on edges repaired by tape on back. Some cross-fold separation on top middle fold repaired with tape on back. Writing on back , no bleed-through. In fantastic condition for its age. 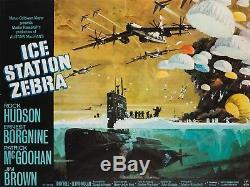 The item "Original Ice Station Zebra UK Quad, Bob McCall, Film/Movie Poster" is in sale since Monday, April 9, 2018. This item is in the category "DVDs, Films & TV\Film Memorabilia\Posters\Originals - UK Quads\1970s". The seller is "orsonandwelles" and is located in Bath. This item can be shipped worldwide.